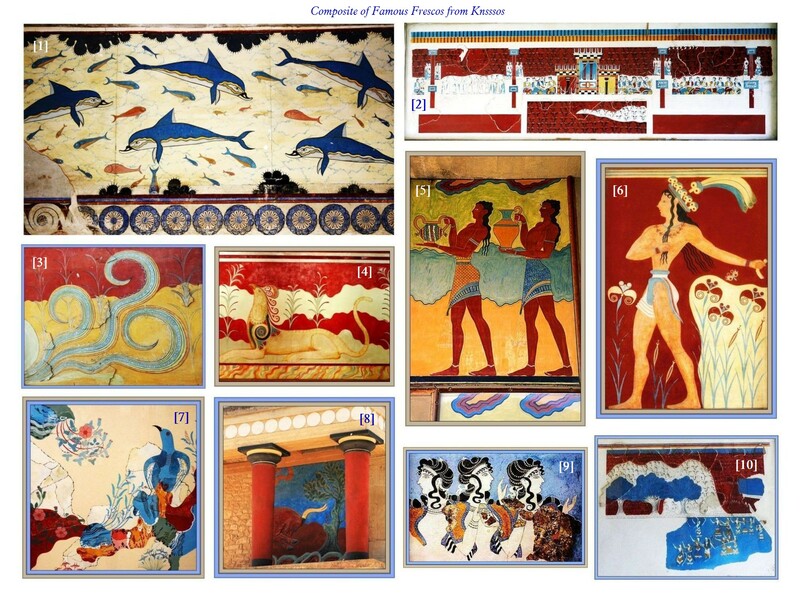 Please note that the originals of all the frescoes at Knossos are now housed in the Heraklion Archaeological Museum. Those found onsite at Knossos are copies, though splendid ones at that. The addresses are not hot linked here. You will have to copy them into your address book, and then send me your answer(s). The more folks who answer, the merrier. So let’s all have a bit of fun! Once I have all the results in, I shall list your own favourite(s), and mine too, of course! This should be plenty of fun for everyone, and besides, I do wonder how much overlap there is in people’s tastes. Please do participate! We do not usually get much participation from our followers, so now is your chance to rectify the situation. Once we have all the results in, I shall repost all 10 frescoes in a slide show. I will put my vote in for the Dolphin fresco. I do have some doubts because lovely though these frescoes are they have been heavily reconstructed out of sometimes small fragments and I am never sure where the original ends and the reconstruction begins. Love em all Richard ! but my favourite is The Bluebird Fresco.